Here are some of the other major facilities and infrastructure that aren't back to 100% operation because of damage from Superstorm Sandy. Ellis Island: Although the site is open daily to visitors, half of the former immigration processing center is off limits due to ongoing Sandy repairs. Mindy Rambo, a spokeswoman for the National Park Service, which manages the island, said the floors that house its artifacts need special AC and heating units. 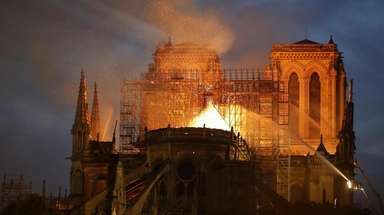 "Until those are repaired, the delicate historical items can't be returned because they have to be in a certain temperature and humidity," she said. Rockaway Boardwalk: Construction on the five miles of boardwalk will begin next week, and the city's parks department said it will be opening up in sections over the next few years. Liam Kavanagh, a first deputy parks commissioner, said the boardwalk will be concrete instead of wood to ensure it withstands future storms. What's more, the boardwalk supports will be steel rather than concrete. "It is something we think will be there for the long haul," he said. The first section of the boardwalk is slated to open on Memorial Day weekend 2015, and the entire walkway is expected to be open for business in 2017. Subways: The Montague tunnel, which connects the R train between Brooklyn and Manhattan, will be closed until October while MTA crews repair the Sandy damage. And the work won't end there. Earlier this month, the agency announced that it will shut down the Cranberry tunnel, which connects the A and C lines between the two boroughs, and the Rutgers tunnel, which connects the F line between Brooklyn and Manhattan, sometime after work on the Montague tunnel is done. Although no timetable is set for the repairs, the MTA said work will only be on weekends.